I am currently reading Dan Roam‘s book Blah Blah Blah: What To Do When Words Don’t Work, and I just finished the chapter that discusses the role of form when turning verbal ideas into visual ideas. Before moving on in the book, I wanted to try to use his framework – the Vivid Grammar Graph – to analyze two recent recordings that I have done. The first is of a conversation between Dan Pink and Jim Collins. 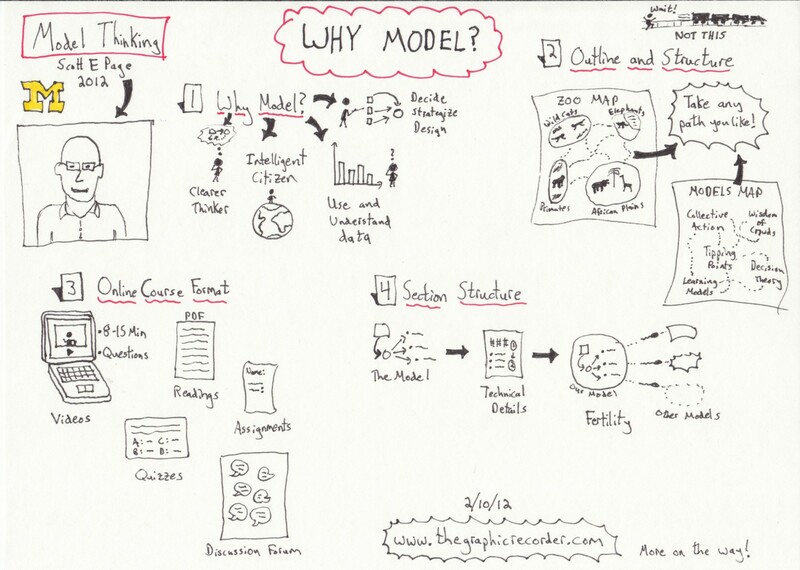 The second is of the first video lecture of a free online course dedicated to model thinking. If you’re not familiar with Roam’s work, check out this chat he had with Nancy Duarte – it will give you some context for the discussion that follows. In the image above I have circled all non-text objects other than arrows and bullet points, and placed those objects into one of three categories: portraits, scenes, and relationships. Let’s start with the first – portraits. According to Roam’s Vivid Grammar Graph, the rule is: hear a name, draw a portrait. That name could be a person, an object, or even a concept. In general, each portrait corresponds to a single noun. In total, I’ve got 11 portraits above. For an hour-long conversation that seems a bit low to me. Next, we’ve got scenes. I consider a scene to be some combination of portraits that tells a story. Scenes are powerful because they offer much more complexity than a single portrait, and have a greater takeaway value – one scene can convey several ideas at once. A scene doesn’t have its own category in Roam’s Grammar Graph, but I think it suffices to think of it as a combination of portraits. Finally, relationships. I think that relationships might be a subcategory of Roam’s charts. Roam’s rule: hear a number, draw a chart. My proposed rule: hear a numerical connection between two ideas, draw a relationship chart. This provides a quick look at how two ideas are related numerically. Overall, I’m happy with the fact that for most of the ideas that I decided to capture, there is at least one visual associated with that idea. With that said, this sketch still seems a bit text-heavy to me, which I think is a result of my inexperience as a graphic recorder. 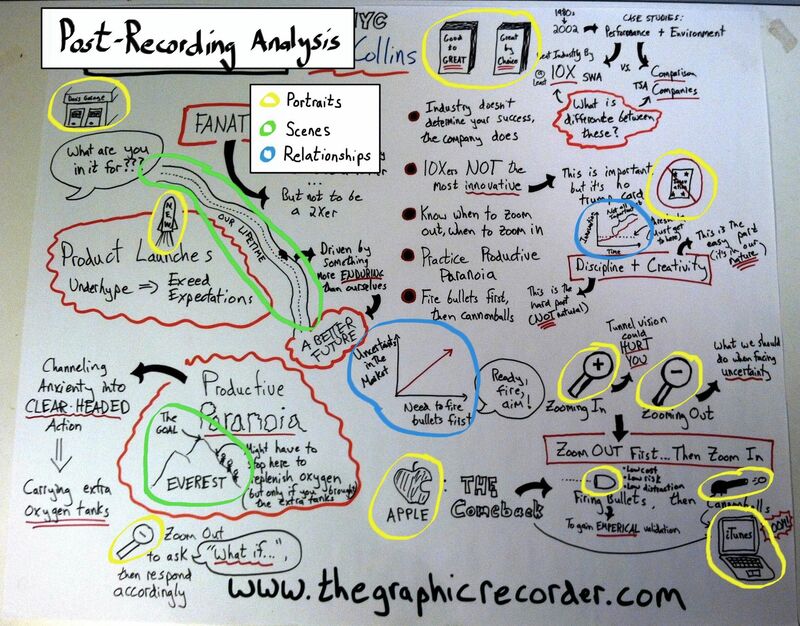 When graphic recording in real-time, there is no pausing or slowing down of the content. So if an image for a concept doesn’t come to mind quickly, I resort to words. It can also be hard to capture the connections between ideas that are separated in time. An idea introduced at minute 2 might be connected to an idea that comes at minute 32, but depending on how I incorporated that first idea into the sketch, I might not be able to connect it visually with the idea that came half an hour later. For that reason you don’t see any examples of the maps, multivariable plots, and flowcharts of Roam’s Grammar Graph in the recording above, which is a shame because those are the most powerful components of Roam’s framework. There are many alternatives to real-time graphic recording that avoid the limitations that accompany that style. One alternative is to go through drafts. In general I’m a fan of going through drafts, and I have done so with some of the graphics that I have posted to this site, but in those cases I have felt the perfectionist in me creeping up to the point where I feel that I spend too much time getting from the first to the second to the third draft. So for now I’m more interested in improving my on-the-spot skills. Notice that this sketch is essentially nothing but portraits with clarifying text underneath. Without the time pressure that accompanies real-time graphic recording, it was much easier to achieve this portrait-heavy text-light result – which I think allows for quicker comprehension and longer retention of the ideas. You can also see a time-line under the Section Structure portion of the sketch. I have developed the style of using straight arrows for time-lines and curved arrows to connect conceptually related ideas. I like the style of Roam’s timelines even better – here is an example (scroll down toward the end of the post). Despite the advantages of the pause-whenever-I-want approach, there is something that draws me to real-time recording. Part of it is the challenge, and part of it is the fact that professional graphic facilitators face that pressure – the pressure of recording a meeting in real-time, in front of all of the participants, with the goal of facilitating the flow of ideas and progress toward some outcome. Another reason for the draw to real-time recording is that I like putting constraints on my work environment because it forces me to be creative in ways that I otherwise wouldn’t have explored. For these reasons I will continue doing both styles of graphic recording (as well as a third style that I hope to discuss soon) because of the distinct challenges they offer.